Early Bloomer. Useful plant, pink bell-shaped flowers, red bark, grey-green leaves. Notes: Heath family. 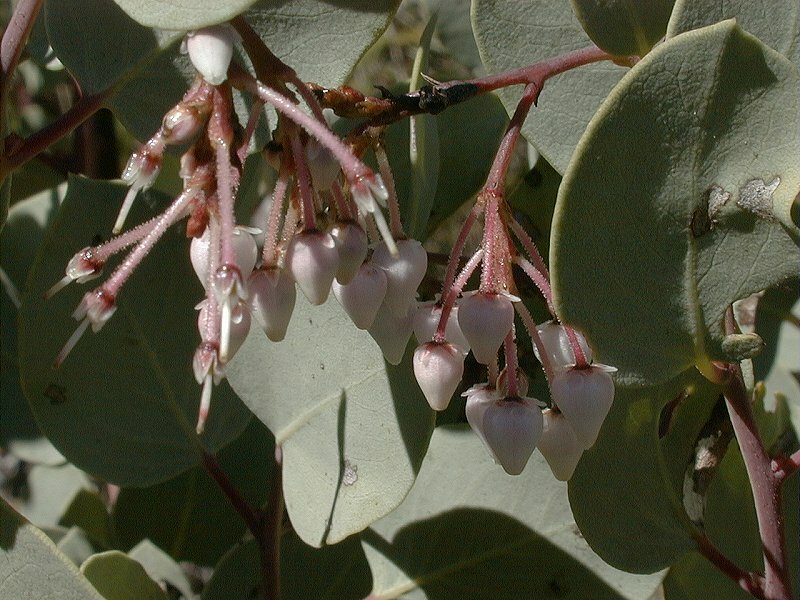 The USDA lists 75 Species of Manzanita and 116 accepted taxa overall. This species grows 4' to12’ tall, has whitish twigs and smooth, pale or gray green ovate to elliptic leaves. Its lovely, nodding pink to white flowers hang in clusters like “hanging bells.” The red berry fruits have a sticky surface, hence ‘viscida.’ Native Americans made a soft drink and jelly from the green berry pulp. They celebrated the harvest with feasting and dance. The berries can be eaten raw, although they can be difficult to digest. They were also dried and stored for the winter. They were stewed, or dried and ground into meal and cooked and eaten as mush. The ground meal also was made into thin cakes and baked over an open fire. A lotion made from leaves was used for treating poison oak. A tonic was also made from the leaves for headache and in a poultice for sores. The fruit and leaves were crushed for their astringent properties to treat bronchitis, dropsy (fluid retention) and other ailments. The wood was used to make spoons and pipes, and as structural members in Native American huts. String from the bark was used for reels etc. The manzanita seeds can stay in the soil for 300 years, and are germinated by fire.